When buying Arizona luxury real estate, bigger isn’t necessarily better – or more luxurious, according to a national survey released by Better Homes and Gardens. In fact, the results indicated that 60 percent of luxury homebuyers surveyed would rather have as many upgrades as they can afford in their home, rather than more square footage. Similarly, nearly all (94%) luxury homebuyers surveyed would be willing to give up 1,000 square feet of living space from their next home in order to get a lifestyle amenity they desire, such as; living in a better neighborhood (54%), living in a house with “character” (51%), more land (44%), access to dining and entertainment (39%), and a shorter commute (38%). The definition of luxury is as individual as you are, so it’s important to find the Scottsdale luxury home that best meets your needs and enhances your quality of life, whether your new home includes more space, more upgrades, that certain location, or all of the above. That’s where Exclusive Arizona Buyers Agents (AZBA) comes in. This distinctive Arizona luxury real estate brokerage, with special expertise in Scottsdale and surrounding areas, is the exclusive expert in understanding your needs because we specialize in the custom needs of luxury buyers specifically. Ask AZBA principal and experienced Realtor(c) Jennifer Fabiano anything about Scottsdale luxury home ownership and the area where she grew up and raised her family, and she'll know the answer. But she goes one step further to ask you, her client, many questions to gain a solid understanding of your needs in order to meet your specialized needs and customize our services to you. As a licensed Realtor® with Realty One Scottsdale for more than 10 years, she optimizes her years of experience in real estate, marketing and public relations to leverage results for you. "I'm dedicated to providing you with the time and attention you deserve," says Jennifer, “and won’t ever lose sight of your needs." 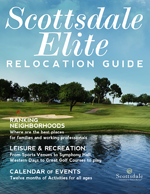 That’s the kind of elite, personalized service that turns your Arizona luxury real estate experience from good to great.